This looks like a cool, high-tech board game for the family to enjoy. A great gift idea for the guy into strategy games and looking to try something new. Be sure to check out some of the customer reviews on the product page. 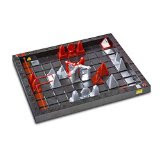 Khet: The Laser Game @ Amazon.com . Click here>> for more strategy game ideas.